Winning Artists Announced for DTPHX Street Pole Banner Program - Downtown Phoenix Inc.
Beginning the first week in April, original work by four local artists will be showcased on street pole banners in Downtown Phoenix. The pieces were selected through a public call to artists by the Downtown Phoenix Partnership, which manages street pole banners in the Downtown Core, and Artlink Phoenix. One artwork by each artist will be produced into banners. Once complete, the project will result in approximately 90 artist-designed banners. The goal of the artist-designed banner program is to intentionally showcase artists’ creativity — an instrumental force in downtown’s growth and revitalization — to add to the character and quality of the area. 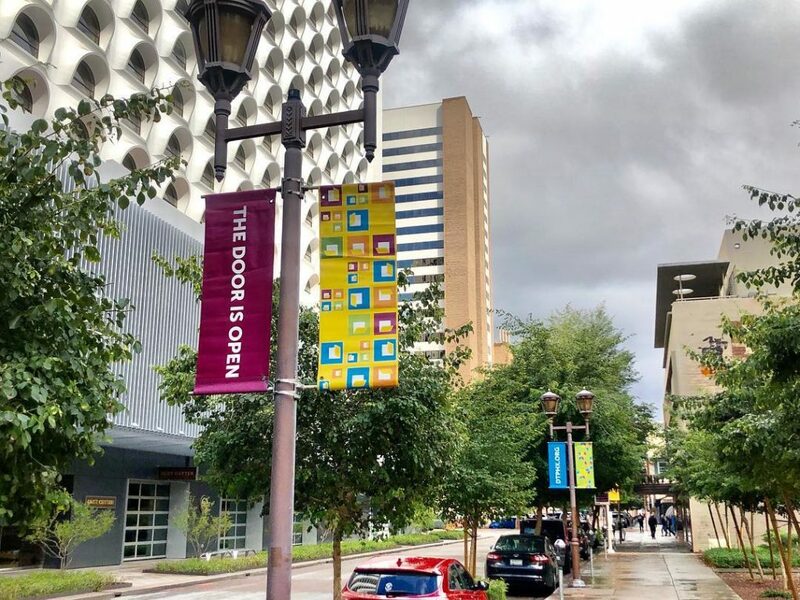 The street pole banners will be showcased within the 90-square-block area of the Downtown Phoenix Business Improvement District – also known as the Downtown Core. This area represents Arizona’s business, entertainment and dining hub, and the Partnership takes great pride in caring for this growing urban neighborhood. From planting trees and supporting the arts to hosting events and telling the stories affecting the city, the Partnership is committed to making Downtown Phoenix a beautiful, welcoming and diverse place. While street pole banners can be used as a form of advertisement, they can also be used as a means of conveying information, sparking curiosity and creating a sense of place.